We are thrilled to announce that Josephine B. and Kate S., a pair of budding inventors in Class VI, won the 2018 Scribble Design Competition! Held at NYU Tandon School of Engineering, the Scribble Design Forum is an annual gathering of middle school, high school, undergraduate, and graduate students interested in product design. This year, the Forum included a team-based competition that centered around “students enhancing student life.” Competing against four high school teams from design/technical schools and one eighth grade team, Josephine and Kate won first place for their unique invention, the Tipper Stopper. After seeing firsthand the dangers of tipping back in their chairs during class, Josephine and Kate first conceived the idea for this invention during a STEAM project with Ms. Wang in the Lower Mid. Kate explains, “7,000 students a year go to the hospital for general injuries, and 70% of those injuries are caused by students tipping back in their chairs. 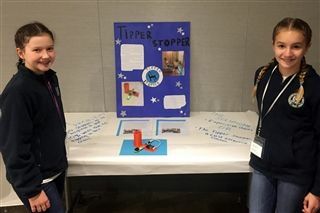 It was very important that we create a product that could enhance students’ safety.” Using littleBits and pieces they 3D-printed in the Fab Lab, they designed a prototype for the Tipper Stopper which makes a buzzing sound every time a chair leg is lifted off a pressure sensor, reminding students to put their chair down and sit properly.